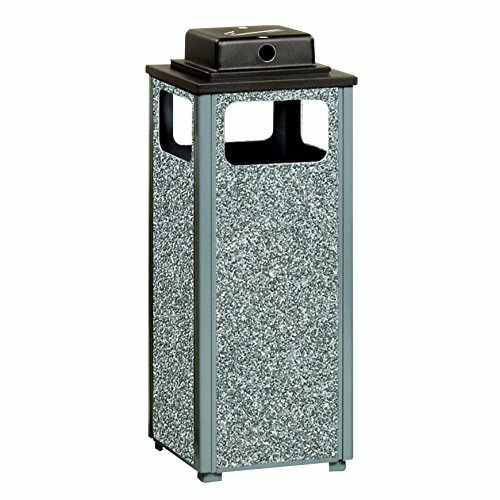 The Rubbermaid Commercial Products FGR12WU2000PL Dimension 500 Series Ash/Trash Refuse Container with Weather Urn is a rugged, practical design intended for heavy, constant use. Lift-off sand urn top allows easy access and emptying of rigid plastic inner liner. Four 9 inch by 5 inch disposal openings allow waste insertion from all directions. Exterior stone panels provide a Class A fire rating. Weather urn collects cigarette debris and protects contents from the elements. This container is constructed with recycled consumer product (RCP) material, making it an ecologically sustainable item. Lift-off sand urn top allows easy access and emptying of rigid plastic inner liner. Four 9 inch by 5 inch disposal openings allow waste insertion from all directions. Exterior stone panels provide a Class A fire rating. Weather urn collects cigarette debris and protects contents from the elements. This container is constructed with recycled consumer product (RCP) material, making it an ecologically sustainable item.